Below is a list of the top 10 benefits of laser therapy. Laser therapy is done in-office at Hampton Chiropractic located in Belton, MO. The class-4 laser used in laser therapy causes vasodilation in the cardiovascular system which results in decreased swelling at the site of inflammation. This is great for surface inflammation such as the bruising/swelling that happens after a sprained ankle, but also great for deep inflammation such as the inflammation brought on by arthritis. Laser therapy effects the nerve cells by blocking pain signals sent from these cells to the brain. This decreases nerve pain/sensitivity, and explains why after treatment with laser therapy, patient’s notice an immediate improvement in pain levels. Also, because of the anti-inflammatory effect and decreased swelling, this further alleviates any nerve pain. Laser therapy is great for sprain/strains after injuries or heavy lifting. The light energy during treatment penetrates into the deep tissues and increases the energy available to the cells in that particular area. This energy allows the cells to get rid of waste products more efficiently which results in speedier recovery times. This is great for injured athletes wanting to get back onto the field quicker or just the average person who injures themselves and just wants to be pain free again. Our bodies have the ability to create what are called collateral pathways in the arterial system. Essentially, when there is a damaged capillary (part of the arterial system) the body can create a new pathway to bypass the injured area. Laser therapy works by increasing the formation of new capillaries in areas of injury. This speeds up the healing process and reduces scar tissue. For example, this is great for injuries to deep tissue due to whiplash from a car accident, but also great for cuts and scratches on the surface due to the same car accident. It’s really quite remarkable! Laser therapy works on the cellular level by targeting the cells’ mitochondria. This process results in greater oxygen and food particles for blood cells as well as increases the production of specific enzymes needed for the body’s healing power to do its thing. Laser therapy is great for trigger point therapy. It directly effects the musculoskeletal system resulting in relief of muscle tension and pain. Many patients report improved ranges of motion in the areas of treatment. In fact, take for example neck pain/tightness. Laser treatment needs to be done on both sides of the neck. If only one side is treated, the patient feels tightness/pain on the untreated side. Many patients take notice of this at their first treatment, because they feel the positive difference immediately in the area treated. Scar tissue formation occurs after injury to tissue in the body. If this scar tissue is not “broken-up” and released from the body, it results in weaker tissue and makes you more prone to re-injury and chronic pain. This chronic pain can occur in the low back, the neck, the shoulders, the ankle and so on. In fact, the best example of scar tissue being overproduced is repeated ankle sprains. The body continues to replace the damaged ankle with scar tissue which is weaker than normal “fully-healed” tissue. If the damaged ankle is not fully healed with normal healthy tissue, you’ll continue having chronic ankle pain and repeated sprains. Laser therapy is an option for treatment in this scenario because it is great at reducing scar tissue formation after injury. This results in full recovery after injury and no more chronic pain for you. Laser therapy works well in conjunction with chiropractic care because of both their benefits on the nervous system. In particular, laser therapy is great at healing damage to nerves. This is particularly helpful after a significant injury in which signs of nerve damage are present such as numbness and tingling. Without treatment, the body can heal itself however nerve repair can take as long as 2-3 years due to slow axonal regeneration and slow recovery process. Laser therapy is a great option for treatment because it speeds up this process of axonal regeneration and nerve cell reconnection. This means improvement of symptoms and no more numbness and tingling. Laser therapy can also help with boosting your immune system. Laser light has a direct effect on the stimulation of the immune system such as the lymphocytes and immunoglobulins. Again, the laser light targets the mitochondria in the cell which stimulates the production of ATP, the body’s energy. This is important in providing the body with the necessary energy to fight off those pesky bacteria and viruses. Whether it be from diabetic ulcers or a cut wound from working in the kitchen, laser therapy can help speed up the healing process. Laser light stimulates fibroblast development and fibroblasts are responsible for collagen formation. In turn, collagen is the necessary protein for replacement of old tissue/repair of tissue injuries. Long story short, if you have a wound give laser therapy a try! 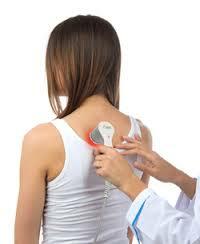 At Hampton Chiropractic, we have seen and experienced the benefits of laser therapy first hand. For this reason, we are extremely excited to be able to offer this kind of treatment in our practice. The laser treatment itself is a pain-free process as the laser produces a pleasant heat in the area being treated. With that said, if you have any chronic pain or recent injury, give our office a call today and experience the benefits of laser therapy for yourself!